Firstie Favorites: Math Freebie Extravaganza! Hello there! I could not be more excited to write this blog post! I am a huge proponent of math workshop in elementary classrooms. Four years ago, I switched from a more traditional math block to a math workshop approach and I have never looked back. My students are so much more engaged and I can meet their individual needs so much more successfully! The honest truth about beginning math workshop is that it does require a lot of prep up front to prepare engaging math centers. Over the last few years, I created over 100 math centers and then printed, cut out, laminated, and organized them for use in my classroom. In the first few years of math workshop, I used more paper/pencil activities and worksheets in my math tubs as I slowly build my collection of prepped math centers. This year, I am finding that I have a well-developed selection of math centers to pull from each week. Now, that is not to say that I don't use paper/pencil work in the bins from time to time, but most of my math centers are interactive and engaging for students. One thing that I have learned over the past few years is that I need a way to hold students accountable for the interactive work that they are completing. The majority of students in my class each year would complete the centers and do well because they are engaged and want to learn the math skills. However, we all know that you are always going to have those few students that try to get out of their work and don't devote their full attention to their centers. For this reason, each of my math centers has an exit slip that corresponds to the content in that center. My students complete this exit slip after completing the center which holds them accountable and provides me a simple way to assess their progress. 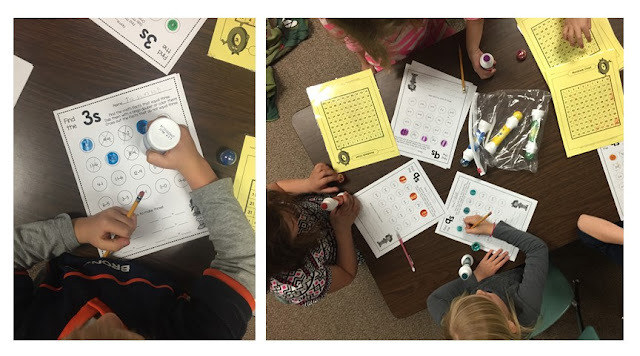 My purpose for this blog post is to provide you with some FREE math centers to get you started with trying math workshop or to add to your own collection of centers if you are already using the math workshop model in your classroom. Some of these centers have fun themes and some are more general for any time of the year! Simply click each photo to download the center! (If you want the short cut to my TeachersPayTeachers 10 Free Math Centers page - please click this link) Enjoy! This center includes skip counting cards from 2s, 5s, and 10s and an exit slip for each set! Dab it! Dot it! Math Facts! This Dab it Dot it Math Facts center is always one of my students' favorites! We use bingo dauber markers to find math facts that equal a given number. Then students record the math facts at the bottom of the page! For the Number of the Day, I post a number on the board. Students complete the worksheet based on that given number. Easy peasy prep for this one! Dominoes are a great math tool for teaching early addition and subtraction. My students love using dominoes as manipulatives! When they finish their work, I allow them to build little domino towers.... you ALL know that students can't get through a domino activity without using them to build something! LOL! Coin Math with Dimes, Nickels, and Pennies! Learning to count money is an important life skill and it also helps students develop a better number sense. In this money math center, students determine the number of cents on each card and then match the letter on the card to the correct amount on the exit slip. I put these cards on rings for each storage and use. This baseball base ten center is great for spring. Students match the expanded form, base ten blocks, and the traditional number in these fun puzzles. 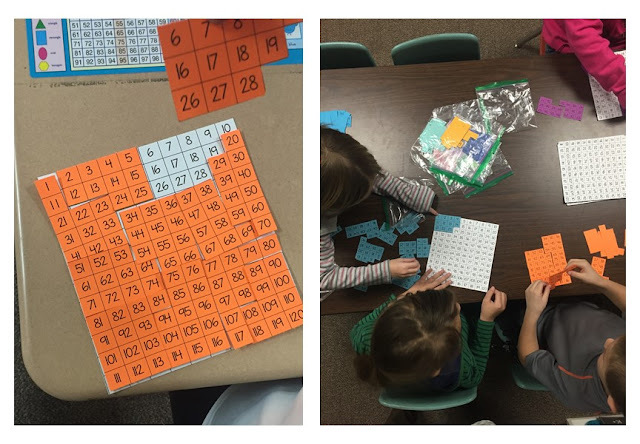 Number grids are one of my favorite resources for first grade number sense. I found this idea on Pinterest several years ago and I love it. I simply print these 120 number grids of fun colored cardstock and then cut them apart. I have about 15 different colors in a bin and they are all cut differently. Students can either complete the puzzles by laying them on top of a already assembled number grid or without the white number grid guide. Easy for differentiation and students can trade their color for a new one when they complete it! Roll and Solve Math Facts! This monster math roll and add center is one of the first centers that I created four years ago. If was an instant hit with my students. Now, let's be real... I have had to replace the monster dice in the last few years. They are made of thick cardstock, taped together at the corners. They have fallen victim to students who have accidentally stepped on them! Eek! Ha! I probably got about 3 years out of the dice before having to replace them! I laminate these roll and add mats so that students complete them using dry erase markers (I recommend using skinny, black dry erase markers - I have found that they are the easiest to erase). Count Out Coins Money Math! This was another of my original math centers that I created. Students pick money amount cards and then use plastic coins to make that amount. Students record the amount and how they made that amount on a corresponding worksheet. Simple and effective... I don't know about you, but my students LOVE working with fake coins! I use this apple counting by 2s center at the beginning of the year. We always do an apple themed week and this is the perfect addition to our math that week! Okay, so there you have it! 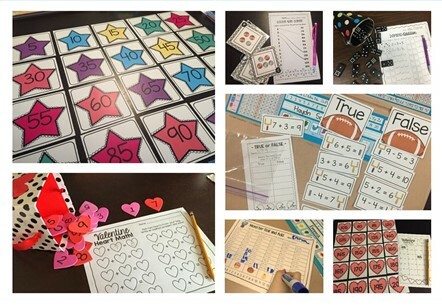 Ten free math centers to get you started on your math workshop journey! Please feel free to contact me at firstiefavorites@gmail.com if you have any questions for me about math workshop or how I use these centers during my math block! This is a great info, Very helpful. Thanks for sharing. Do you have a comparison chart that compares Firstie math and Eureka math? Principal is meeting with us on Wednesday. Anything will help- thanks!